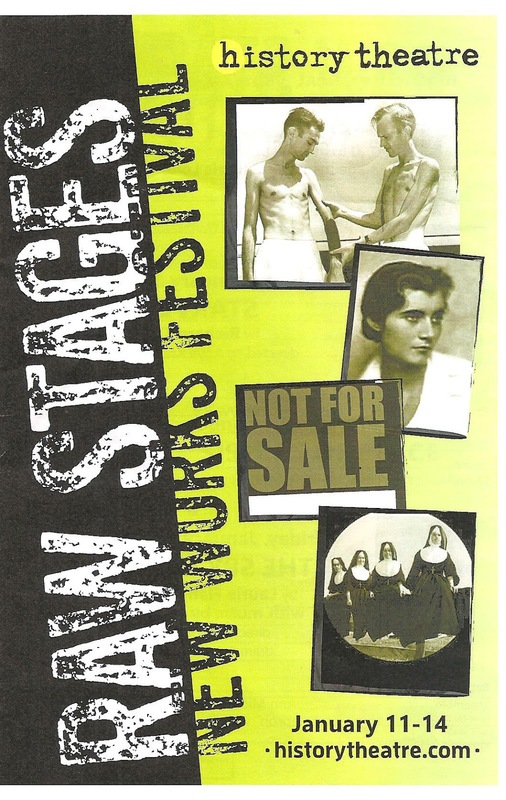 I love the History Theatre for their dedication to producing new works of theater about true events and people in Minnesota history, which is never more in evidence than during their "Raw Stages" festival, which was held this weekend. This annual festival gives playwrights a chance to see how their work sits in front of an audience, and gives audiences a chance to experience a new work in development and provide feedback. But perhaps the best part of "Raw Stages" is that it's quite common to see a play that was workshopped come back for a full production in the next season or two. Two works from last year's festival will be produced at the History Theatre next spring: Playwrights' Center core writer Harrison David Rivers teamed up with Somali immigrant Ahmed Ismail Yusuf to write Ahmed's story in A Crack in the Sky, coming in February; and the writers of the smash hit musical Glensheen, Jeffrey Hatcher and Chan Poling, have written a fantastic follow-up in Lord Gordon Gordon, coming in May. 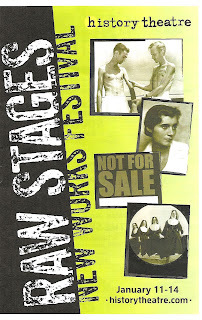 These and many other great plays had their debuts at "Raw Stages." During WWII, conscientious objectors test the limits of their willpower by volunteering for a controversial University of Minnesota experiment on starvation. My day job is in clinical studies, so I'm interested in the history of clinical studies and know a little bit about it, but have never heard of this one. I found the play to be riveting, maybe because of my own interests, but maybe it's just a well-told and fascinating story. Several issues are at play - the conscientious objector and the way the country sees them, the ethics of experimentation on human subjects even if it's for the good of science, and the extreme poverty and want that exists in a world of plenty. At the beginning of the play I thought that the study was ethical because the subjects volunteered (and were free to leave at any time) and were carefully monitored. By the end I had changed my mind; the conditions they were under were extremely taxing to both body and mind, to the point where I'm not sure they were able to give consent anymore, or completely comprehend the damage that was being done to their bodies. Both the scientists and subjects are well-defined characters and the play is well-constructed to tell their story and illuminate the issues, raising questions and allowing the audience to form their own answers. The daring and ingenious Betty Pack - a Minnesota-born socialite turned secret agent - uses her seductive charm to change the course of WWII. I'm a big fan of this duo, and Laurie Flanigan-Hegge (Sweet Land) and Robert Elhai (C., The Lady with a Lap Dog) have tackled a huge story with much promise. They presented only the first act and left me wanting more, which is a good sign. This to-be-titled musical tells the true and mostly untold stories of female spies in WWII, primarily Minnesota native Betty Pack, as well as Vera Atkins and codebreaker Elizabeth Friedman. It's an epic story, involving the complicated politics of pre-WWII Europe, as well as the US and South America, and this first act sets up the second act payoff well. There are a lot of players in this story (well played by this phenomenal cast in a myriad of accents) and halfway through the story it was a bit unclear how they all tied together, but with a great score and touches of humor, I'm super excited to watch this one evolve into the potentially fabulous musical it could be. In the 1960s, a Minnesota realtor loses everything in his attempt to sell houses to minority families in all-white neighborhoods. In a way this play is The Highway Men, Part 2. After many black families were displaced in the construction of Interstate 94 in '60s, they struggled to find other neighborhoods in which to buy houses because of segregation (yes, even in Minnesota neighborhoods were segregated, and many still are). One realtor sacrificed literally everything he had (his marriage, his home, his career, his health) to help people of color buy houses in all-white Twin Cities neighborhoods. This is his and his wife's story, as told by his daughter Barbara Teed. It's a truly remarkable story of an admirable man, but the ending is a bit of a downer with the couple split and him out of business. I would love some sort of postscript or epilogue that told us what the lasting effects of his sacrifices were. In the post-show discussion, the playwright asked the audience "is this play still relevant" and the answer was an overwhelming "yes." While neighborhoods may no longer be able to claim "whites only," it's still implied in some neighborhoods or desired by some people. This play is obviously a labor of love for Barbara and co-writer Kim Hines, who has her own story of the difficulties black families faced in purchasing homes in the not too distant Minnesota past. Four Catholic nuns and real-life sisters Jane, Brigid, Kate and Rita McDonald take to the streets to stand up against injustice – with plenty of singing, Irish humor, and several stops in jail along the way. I couldn't make it to this one but it's right up my alley so I hope it makes it into the season next year!